There are essentially four components to each of our SMUs; the water quality sensors, the data loggers, the modem for transmitting data back to the lab, and a power source. The unit on Kingsbury Creek has these plus an automated water sampler that collects water from the stream whenever the stream reaches a preset minimum depth. Water quality sensors for stream depth, specific conductivity (EC 25), and turbidity are on a Yellow Springs Instrument (YSI) 6900 series sonde (Chester and Tischer) or a 6820 sonde (Kingsbury). The image below shows the probes mounted on the end of a sonde. Go to the Water Quality Primer to learn more about how these probes work and how we use the data collected by the sondes. The probes are set to measure each parameter every 15 minutes. The information is then recorded either within the sonde itself or sent via a cable to the Isco sampler. This is the data logging step. A modem is then used to get the data to the Duluth Streams computer. We usually call the SMUs weekly to download the data but we also have the ability to see the data real-time. 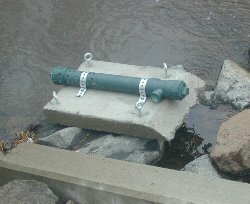 The sonde is protected from rocks and other debris by a PVC housing strapped to a cement block that holds the unit in place on the stream bottom. Of course we need electricity to run the entire operation. The Kingsbury SMU is powered by a 12 volt battery that needs to be replaced with a fully charged battery every two weeks or so. The Tischer and Chester Creek SMUs are also battery charged but the batteries are recharged automatically by small solar panels. The St. Louis River SMU has a different configuration. For more information and photos of the installation near the Duluth lift bridge go to the Water on the Web St Louis River page. Individual storm events in Kingsbury Creek are monitored using an automated water sampler (made by ISCO). 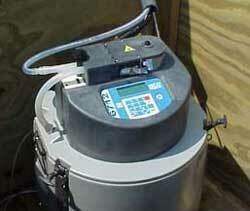 The sampler is triggered by increasing water levels, and collects a water sample every hour during a storm event.